A purple cow is something out of the ordinary. Many of the cows I paint are derivatives of the purple cow, both figuratively and literally. They are not a frequent subject of my painting, though I do enjoy creating their portraits. Literally, I use a mix of Ultramarine Blue and Alizarin Crimson to create the dark color of their hides. The blue and crimson results in a very dark purple that I substitute for actual black. I seldom use black paint because it tends to be dull and lifeless, so instead of black paint, I use purple. 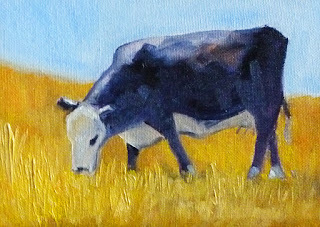 This cow was created on a 5x7 inch canvas panel. She is for sale in my Etsy shop and can be viewed or purchased at this link. Even in cold weather, these little Chickadee's seem to be having a good time meeting up. They flit around, hide in the underbrush, and don't seem terribly bothered by the cold. It was fun to paint this sweet thing. 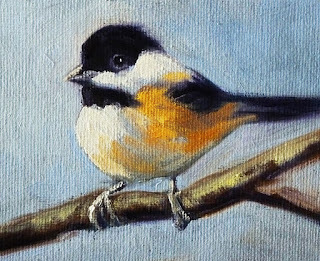 Although it has already SOLD, I have other small paintings of birds and animals for sale in my Etsy Shop, Small Impressions Paintings. The little snow storm that happened in the Northwest turned into a big one. It is Friday and I finally left the house today after a week of snow and ice. Though our weather might be the norm in winter for other parts of the country, this part of the world is never prepared for snow. With only twenty snow plows in the entire county, side streets never get cleaned and we slip around or stay home. The best part of getting snowed in is that I spent a lot of time in my studio. This little 6x6 inch painting provided the sunshine I longed for while stranded in the house. It is for sale in my Etsy shop and can be viewed or purchased at this link. It has two companions that are also available. Visit here and here to view them in the shop or make a purchase. The snow continues to pile up and I am happy to have a nice warm home from which to watch. The crows that live in the neighborhood don't have it quite so nice. They must be shivering in their nests. I only get brief glimpses of them when there is a pause in the flurries and they venture out for an abandoned scrap of food. It is these brave little creatures that inspired this painting and its companion. This fellow is for sale in my Etsy Shop. 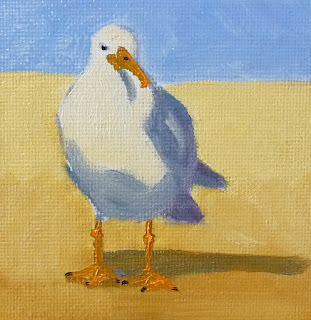 Click here to view or purchase this one or click here to view his companion. Both are 4x6 inches on canvas panels. They were fun to paint as I watched the storm outside and felt grateful that I'm not a crow in winter. It has arrived--the first winter storm of the year. In the Northwest, we only have snow a couple of times of year. Because we are not used to it, everyone panics. Schools close down, people stay home, and life moves very slow until the roads clear again. So, I am enjoying the slow down, painting, and relaxing while the snow piles up and the news channels broadcast every fender bender and slip and slide episode that occurs. 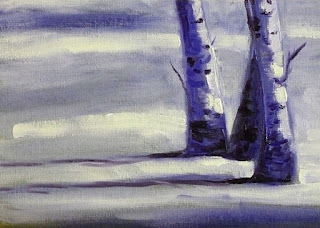 This little painting is a tribute to our first winter storm. It is 5x7 inches on a canvas panel and can be purchased at my Etsy shop. Visit this link to view it in the shop or make a purchase. Recently I painted a series of little seagull paintings. This is one of four. They were fun to paint on little 4x4 inch canvas panels. I am amazed at how many different kinds of seagulls populate the beaches here in the Northwest. Since I am not a bird watcher, I don't know how to identify different varieties, but it was great fun to paint them. 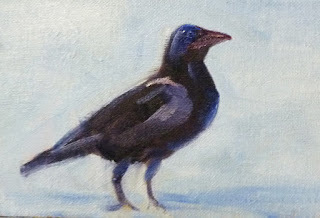 One of the four has already SOLD, but this one and another of the series are both for sale at my Etsy shop along with some of my other small paintings of birds and animals. Click here to view this painting in the the shop or make a purchase. I will be adding the fourth, and final painting in the series, so check the shop often for updates and new paintings. A little berry for the day! I had a good time painting this colorful fruit. It looks simple, but getting all those seeds and the reflected light provided quite a little challenge. The painting is for sale in my Etsy Shop, Small Impressions Paintings, along with some of my other small paintings of fruit and kitchen art. Click here to view it in the shop or make a purchase. Happy 2012! 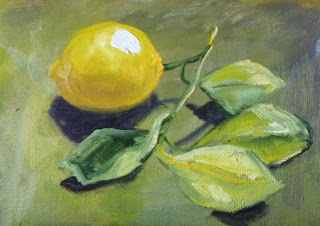 The plan was to take any lemons from 2011 and make something really sweet--something like this little painting. 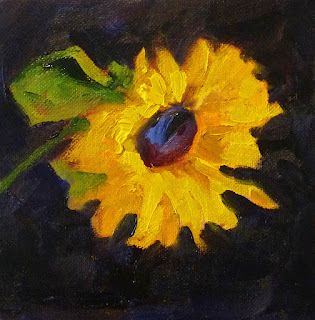 It is 5x7 inches on a canvas panel and was for sale at my Etsy Shop. 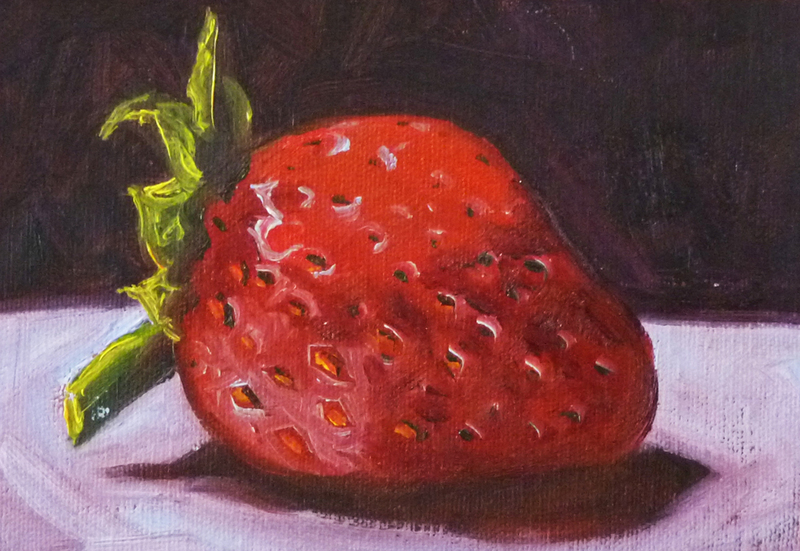 It has SOLD, but there are many other small paintings of fruits. Visit these two links to see more: Tropical Fruit Paintings and other Small Fruit Paintings.